November 1st is a special holiday here in Poland, known as All Saints’ Day in most Catholic countries, or Wszystkich Świętych in Polish. Today, Poles will flock to the cemeteries to remember and honor their deceased family members and friends by leaving flowers and candles on their graves. Later this afternoon, we plan to visit the Cmentarz Powązkowski, also known as Stare Powązki, a historic cemetery dating back to 1790, located in the Wola district of Warsaw. Last year, we missed this holiday because we were in Berlin for the long weekend. Apparently, the Polish cemeteries, decorated with hundreds of flickering candles and flowers, will really be a sight to behold today. Everyone will be there to celebrate and pray over their deceased loved ones. Volunteers also help to make sure that no grave is left without a candle. I think that’s a nice touch because I’ve seen so many graves in America that look abandoned. Last year, we visited Powązki Cemetery a few days before All Saints’ Day as part of a special tour to learn more about its history. Dozens of family members were already working on cleaning up leaves and other debris around many of the tombs. The cemetery is full of ornate, moss-covered tombstones that were created by some of the most renowned sculptors – both Polish and foreign. Between 700,000 to 1.5 million people are buried here. During World War II, the cemetery served as a shelter for the people and Resistance fighters. Then, during the Soviet occupation, this was the only place where Polish characters were used and the Polish language was spoken in public. The cemetery is full of history. 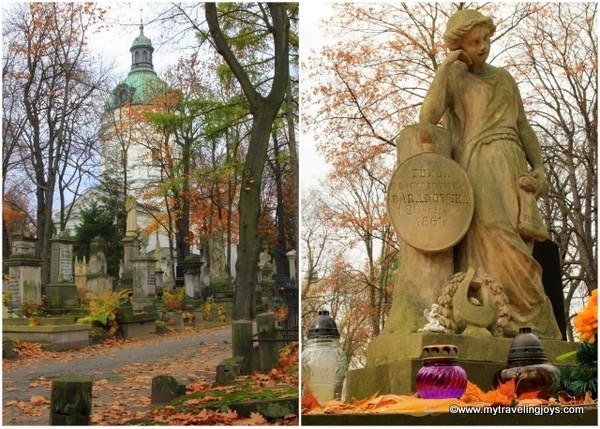 During the tour, we learned the Powązki Cemetery is the final resting place of many famous historical figures in Polish history, including those interred along the “Avenue of Notables” (Aleja Zasłużonych) established in 1925. For example, the ancestors of the English and Spanish royal family were descended from Poland. The Battenberg family was a morganatic branch of the House of Hesse-Darmstadt, rulers of the Grand Duchy of Hesse in Germany. The first member was Julia Hauke, who came from the Warsaw area, and is buried with her husband at Powazki. She is reportedly the great-, great-, grandmother of Prince William, Duke of Cambridge. Izabella Moszczeńska-Rzepecka, a Polish writer and suffragist. Tekla Bądarzewska-Baranowska, a well-known Polish composer and pianist from the late 1800s. Marie Curie-Sklodowska, a Nobel-prize winner in chemistry and physics. 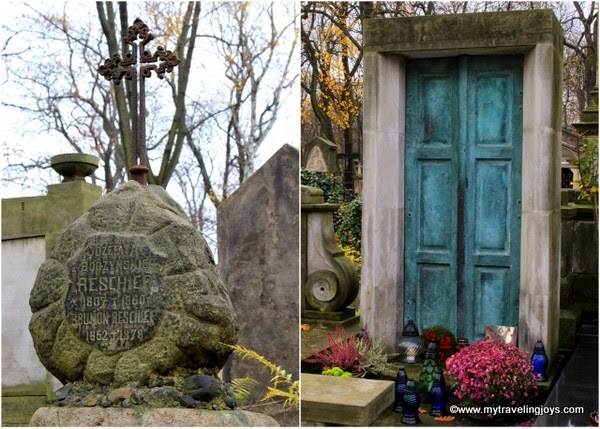 As you can see from these photos, the Powązki Cemetery is an interesting place to explore and photograph. I cannot wait to see what it looks like tonight for All Saints’ Day. Look for the domed-Kościół pw świętego Karola Boromeusza (St. Charles Borromeo Parish) at the Powązki Cemetery. The nearest tram stop is called Powązkowska. The facade of the St. Charles Borromeo Parish at the Powązki Cemetery in Warsaw. I much prefer this celebration to the overkill of halloween. 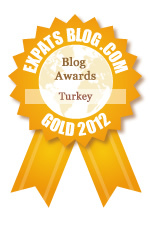 Not that it is celebrated in Turkey. @Annie True! Halloween can be a bit overrated. I love touring cemeteries, there's so much interesting history there. Are those chestnuts being left on the graves? Any significance to that? Hi Heather! 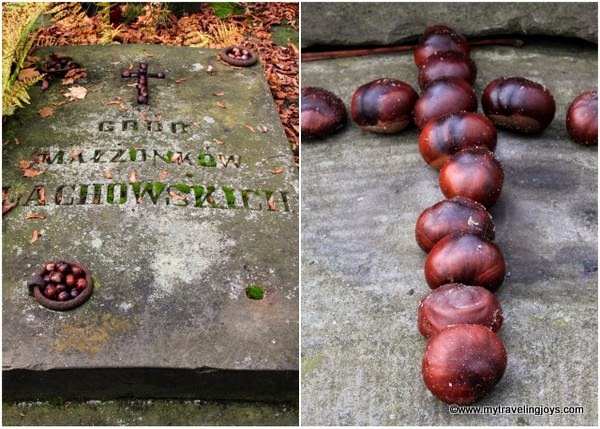 From what I understand, placing chestnuts or small stones on graves was originally a Jewish tradition to let the deceased know they were still thought of/rembered. It wouldn't be far fetched to think the Poles picked up that tradition.